It’s August in New England, and corn is at its peak, so are tomatoes. Currently, my husband Howard eats a minimum of two and sometimes up to four ears a day. My digestive system can only handle one ear a day. 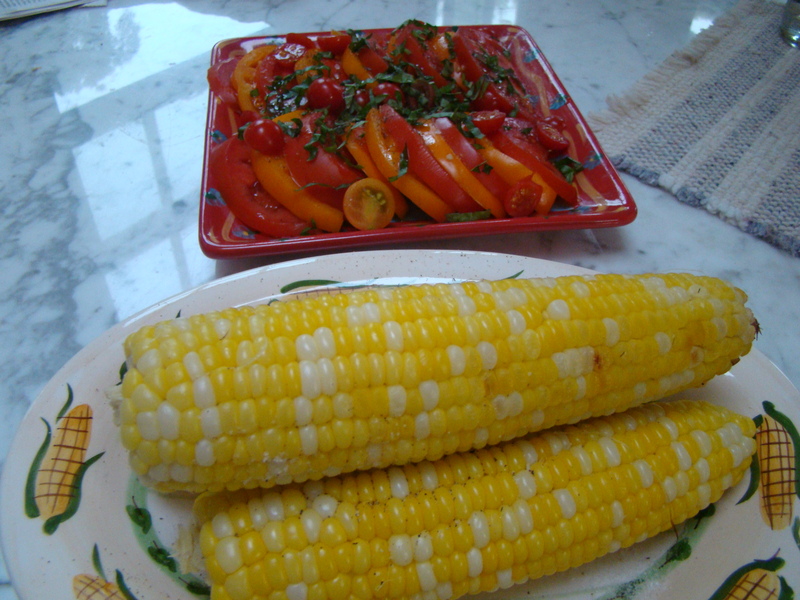 Nevertheless, during this brief four to six week window of summer vegetable perfection, corn and tomatoes rule our table. Unlike most of America, we eat our corn plain, with no butter. Certainly that helps make four ears of corn daily seem like a healthy choice. This is the perfect time for this week’s recipe for French Fridays with Dorie! And, this recipe was so simple, not really even a recipe, just a new-to-me method of cooking corn on the cob. Dorie learned this technique from the patron of a vegetable vendor at the Boulevard Raspail market, one of Paris’ organic produce markets. The vendor spent a long time helping the shopper, and Dorie was impatient waiting in line. 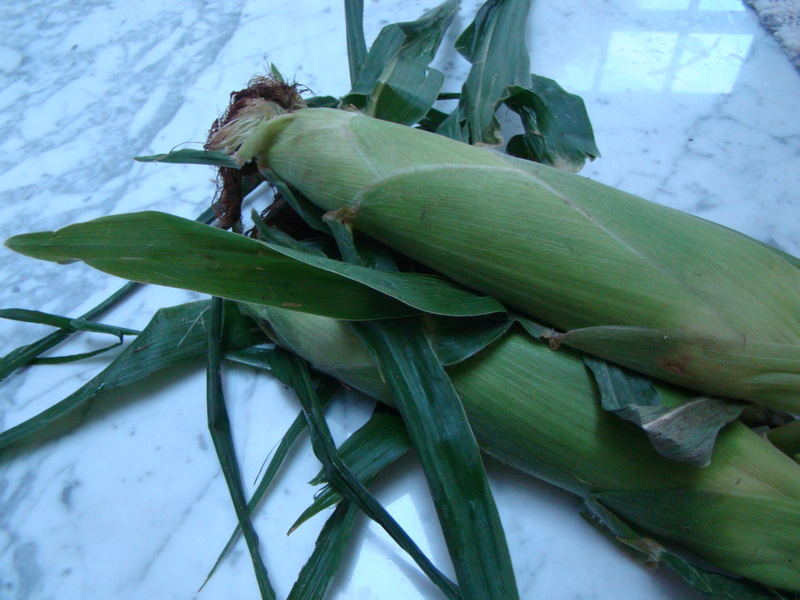 Fresh corn is not the most popular vegetable in France. It turned out that the woman purchased some tired ears of corn, which the vendor recommended to roast in the oven. Whole unhusked ears of corn go into the oven, and forty minutes later, caramelized ears are ready to be shucked and eaten. We only sprinkled the ears with salt and pepper to dress them up a tiny bit, no butter. I’m sure those tired ears were enhanced by this preparation. Certainly, it did wonders for the ideal specimens I cooked. On the other hand, forty minutes is a long time to wait to cook corn, especially for a summer dinner. Usually, our corn spends just a few minutes in the microwave. I’m not sure the difference in taste justifies the longer wait so roasted corn could be a one-hit wonder at my house. To see what the other Doristas thought of the French market way of cooking corn, check out their links here. We don’t post the recipes, but you can find it in Dorie Greenspan’s book Around My French Table.